It’s the eve of Election Day. I’m anxious, just like the rest of America. I worry about the divisiveness in our country. This tumultuous election has revealed bigotry in many forms, toward people of color, toward Jews, toward people with disabilities, and toward Muslims. Yet, I have a twinge of hope. Look at the photo above. I’m standing with Muslim, Christian and Jewish women. All of us belong to the Daughters of Abraham, a book club for women of these three faith traditions. The women with me belong to a club based on Cape Cod and drove up to Winchester yesterday for the club chapters’ annual fall gathering. I gave a talk about how education about the world’s religions has made a difference for some youths. I spoke about about young people whom I interviewed for my book Faith Ed. A Muslim boy and Jewish girl described how they believed their world religions course made peers more willing to speak up against stereotypes of Muslims and Jews. At the same time, they learned about other faiths. I spoke, too, about a young Christian girl who became upset when she realized she could’ve been as bigoted as others she saw in a video about opposition to a mosque. She credited her school’s course on world religions with making her more open-minded. In the span of a semester, she lost her own fears of Islam as she began to realize it was just a faith, like her own. Our gathering was at the Parish of the Epiphany in Winchester, and you can get a glimpse of the beautiful sanctuary in the photo below. The church, after we left, started a 48-hour prayer vigil which would end after the election. Were they praying for someone to win, I asked a member of the church? No, she said. They were praying essentially for peace and for the harmony our country now desperately lacks. About 60 to 65 of us came together from all over New England. Some of us were strangers. Some of us had known each other for years. We shared our stories of growing up Jewish, Christian, and Muslim in America. We belong to a group that was founded after 9/11 out of the pain some women felt at seeing the growing Islamophobia. Our book clubs are flourishing. That, to me, is also a sign of hope. 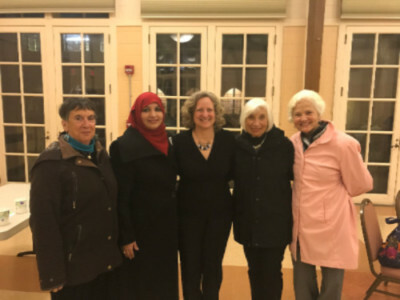 So was seeing 100 people, again of several different faiths, when I went to the Islamic Society of Boston mosque in Wayland on Oct. 30 to give a talk and moderate a panel discussion for the Weston-Wayland Interfaith Council. 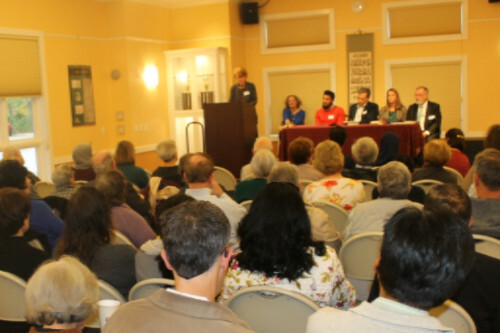 A rabbi, a Muslim chaplain, a pastor, and a middle school teacher participated on the panel. 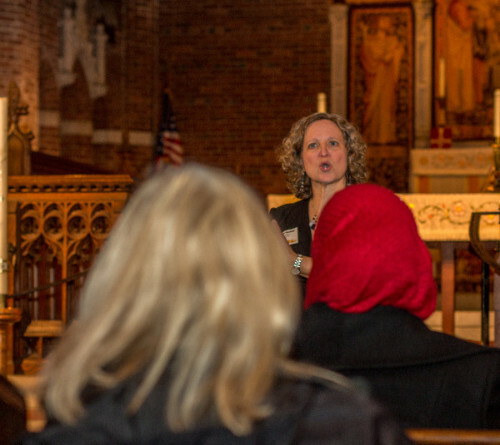 By their very nature, interfaith groups provide hope. Their goal is to unite people of different faiths, to visit each others’ houses of worship, and to learn from each other. In these times, their work is more important than ever before. Yes, I worry about tomorrow’s election results. I worry about our country’s future. But I refuse to shelve my optimism after seeing so many people come together intent on discussing ways to learn about different faiths and unite them in America. If anything, the election season has made many of us even more determined to get out of our racial and religious bubbles and talk to each other. It’s one way we can begin to conquer hate. Ps. Find the latest list of upcoming events on my website at www.faithedbook.com. Interested in booking me for a talk or workshop? Please contact Suzanne Swift of the Read On Speakers Bureau, an offshoot of the Jewish Book Council. She can be reached via email at readon@jewishbooks.org. For book club visits, feel free to contact me directly. A new reader’s/teacher’s guide is available for free download at this link. Tagged Daughters of Abraham, Election 2016, Faith Ed, public schools, religion, religion and education, Wayland-West Interfaith Council. Bookmark the permalink.